BC SPCA > FAQs > Pet care & behaviour > ​How to socialize my puppy? 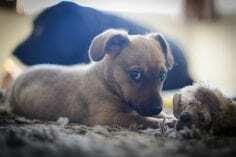 ​How to socialize my puppy? Socializing your puppy is one of the most important things you can do to help him have a happy and healthy life. There is a window or “sensitive period” in which to socialize puppies. This period, often called socialization period, is the first three months of their life. During this time, puppies accept and like things they meet and have a good experience with. It’s not that they don’t experience fear, they do, but we need to prevent them from being scared during this sensitive period. We need to teach puppies about strangers and new things, and help them if they’re nervous. Sometimes people keep puppies at home until they are fully vaccinated at around four months of age. While it is important not to let your puppy interact with sick dogs, and to avoid places where lots of dogs go (like the dog park) until they are fully vaccinated, it is not necessary to isolate your young puppy! You can still take him outside and socialize him with healthy, friendly dogs. Make sure he is up-to-date on vaccinations to minimize the risk as much as possible. Make sure your pup has lots of good experiences so they learn that people, animals and other things are good. Handle your pup so he gets use to having his toes, ears and other body parts touched. Dogs aren’t born used to being handled and we need to teach them it’s OK. Give treats after handling. Make special trips to your vet. Ask your vet to give your puppy a treat when you visit. Try to visit the exam rooms and back of the hospital so your pup is familiar with the hospital and staff. Give treats in each room! Find a puppy socializing class and start classes right away. If your puppy is not well, speak with your vet before going to class. Give your pup some toys and let him play by himself. This may help with over attachment to you. Teach your pup he has a safe place to go sleep or just to get away from things he doesn’t like. Give him choice. For example, if he doesn’t want to be in the room when the kids are playing or visitors are over, let him go to his crate. Forcing him to stay may make him anxious or afraid of the people you’re trying to socialize him with. Your goal is for your puppy to have many different experiences during his first three months. Make sure he has good experiences and use rewards to help him build strong associations. What if I don’t socialize my pup? Puppies who are not socialized during their “sensitive period” may be fearful and aggressive. If they have no experience with different things or people, they can end up afraid of them. Unfortunately, the window for socializing closes at about 12 weeks. You can still help an older dog get used to new things, but they may never be completely comfortable.